The Gem Project, Inc. - We Captivate To Educate > Team Journal > Enrichment Articles: Healthy Eats > Cooking with Besos:Healthy Eats – Oven Fries!! The Gem Project made a partnership with Alnissa Craig of Cookingwithbesos.com. We hope to educate our youth and young adults on developing healthy eating habits. It starts by what you decide to place in your mouth! Alnissa shares her “healthy eats” with us, bi-monthly. Rinse outside of potatoes to wash off any dirt. 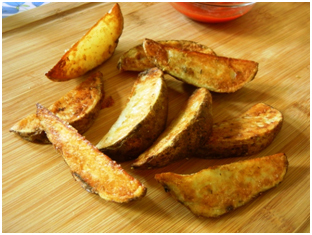 Cut each potato in half lengthwise, then cut each halve in half again lengthwise making fat wedges. Place potato wedges in a bowl. Add olive oil, salt, oregano, thyme, onion powder and garlic powder to potatoes. Toss to ensure all the potato wedges are coated in oil and seasonings. Carefully remove hot baking sheet from oven. Using tongs, arrange potato wedges on baking sheet in single layer, you will hear a nice sizzle as you place them down, this is good! Place baking sheet back in the oven and roast for 30-35 minutes, turning the potatoes once to get the other side browned. Remove from oven when potatoes are crisp and golden brown. Alnissa Craig is a wife, mother of two, enthusiastic home cook, baker and food blogger. You can find her recipes and musing on her blog cookingwithbesos.com and on twitter @cookingwbesos.